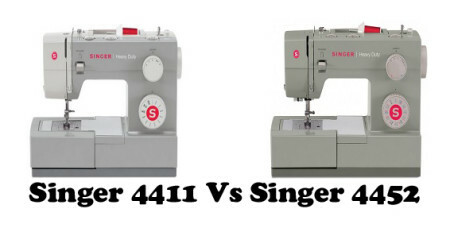 A honest comparison between two similar heavy duty sewing machines, the Singer 4411 and 4452. One will suit beginners and the other offers a lot more room for creativity. 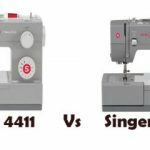 Singer 4411 and 4452 are two heavy duty sewing machines. While 4411 has been selling like hot cakes, 4452 hasn’t quite made it big. There is a decent price gap between the two machines. So it will be worth comparing the two. 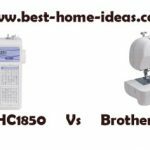 Both machines belong to the same series of sewing machines, so most parts will be shared. You can’t expect 4411 to be entirely different from 4452. Let us now focus on areas where these two machines differ from each other. Obviously there is a color difference. Singer 4411 comes in ash color whereas 4452 has a grey color. Built-in Stitches : This is where the major difference lies. 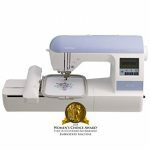 Singer 4452 comes with 32 built-in stitches including 6 Basic Stitches, 7 Stretch Stitches, 18 Decorative Stitches and a one-step Buttonhole. 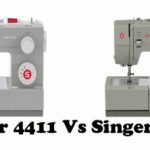 Whereas Singer 4411 has only 11 built-in stitches including 6 Basic Stitches, 4 Decorative Stitches and a 4-step Buttonhole. This clearly suggests that 4411 is a machine aimed at complete beginners. An experienced sewer might find 4411 limited in terms of stitch options and creativity. In simple words, you will get 14 extra decorative stitches and 7 stretch stitches with Singer 4452. Creativity wise, there is no doubt that 4452 is a better machine than 4411. Buttonhole : Singer 4452 wins here with an easy to handle 1-step buttonhole. 4411 on the other hand comes with an outdated 4-step buttonhole which will be difficult for beginners to use. Automatic Needle Threader : This is a big thing, especially for those with poor vision. Singer 4411 misses out on an automatic needle threader, which means you will have to rely on the power of your eyes to thread the needle. 4452 on the other hand comes with an automatic needle threader which threads the needle for you. Accessories : Apart from standard accessories, 4452 comes with bonus accessories including Walking Foot, Non-Stick Foot, Clearance Plate and Heavy Duty Needles. You won’t get this bonus pack with 4411. Since both machines use the same motor and many other parts, you can’t expect a big difference in their performances. 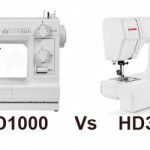 The stitch quality is very good for both machines. The power is also exceptional, especially when you compare these two machines with similarly priced machines from other brands. The motor is at least 35% more powerful than their competitors. These two can easily go through 8 layers of denim. As far as ease of use is concerned, I would rate Singer 4452 a level higher than 4411. 4452 has a fair advantage there, with the automatic needle threader and 1-step buttonhole in addition to the extra stitches and bonus accessories. There is no doubt that Singer 4452 is much more user-friendly than 4411. But one thing that can work in favor of 4411 is the price. If the price gap is less than $50, then 4452 is the better deal. If the price gap is more than $50, you will have to think twice.